A centennial event is a once-in-a-lifetime occurrence. Reporters tap their Rolodexes and databases of contacts to get insightful commentary marking the occasion. With a press release announcing two art and photography exhibitions in conjunction with the centennial of the Queensboro Bridge, Judith Berdy, co-author of a book on the bridge, was positioned as an expert. 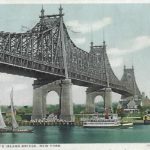 She explained the significance of the bridge connecting the farmlands of Queens to the growing metropolis of Manhattan in 1909 to a reporter. The resulting article in The New York Daily News generated exhibition attendance above expectations. This entry was posted in Case Studies, Media Relations on January 1, 2013 by Janet L. Falk.